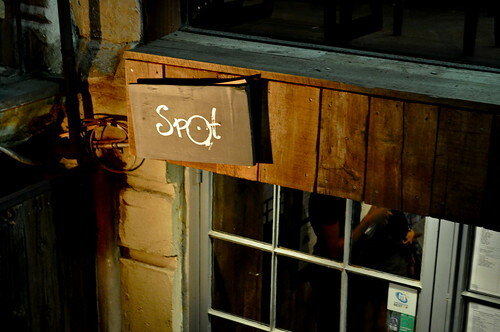 Marcus and I went to Spot Dessert Bar over at St. Mark's after our intense osso buco dinner a couple Fridays ago. We've stopped here previously to try its signature vanilla yuzu lemon buttercream cupcake, which we both found to be quite original and an overall bona fide cupcake. I wanted to go back and try something else so I could properly assess its cupcake and dessert offerings with more edible data :]! Sandwich board outside of Spot Dessert Bar. It was slightly crowded that night, but we only had to wait 10-15 minutes for a table for two. 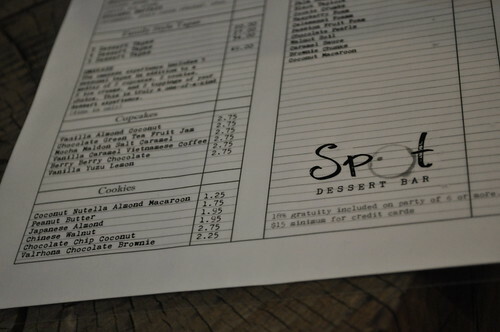 Dessert bar menu at Spot. 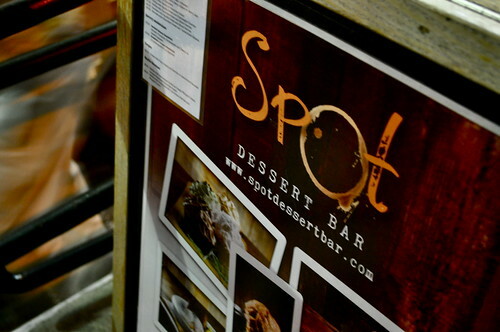 Inside Spot Dessert Bar. I love the low-lighting and the resulting intimate atmosphere created in this basement dessert shop. Very romantic--a great place to take a date after dinner or for a snack. 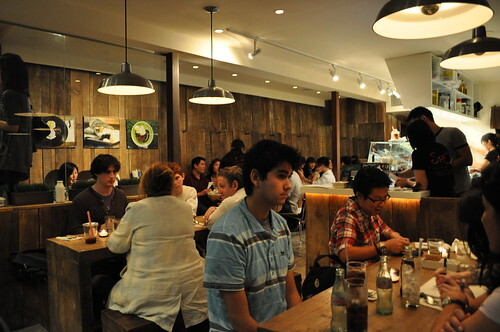 I also liked the warm, earthy-feel created by the wood-paneled walls and modern wood tables. 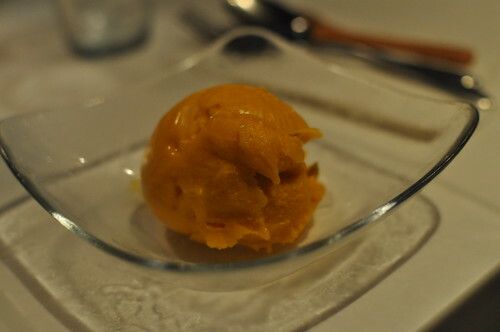 Marcus ordered a scoop of the mango Thai chili sorbet, and it was spicy. That was certainly an unexpected element to sorbet, let alone dessert (as if chili in the title was there to fool us), which is why Marcus wanted to try it. If the essence of Thailand was to be captured in dessert form, this sorbet flavor would be it. The mango gave a refreshing balance against the spicy flavor from the Thai chili. Very different and interesting, but not something I would order again during a subsequent visit. I decided on the mocha Maldon salt caramel cupcake--I think having talked to Linda about the salted caramel ice cream she made a couple weeks ago had me craving some salty caramel! The buttercream was very light, not too sweet, and had the right touch of Maldon sea salt mixed in the caramel and mocha flavors. Lovely combination. The cake part was very light--not very dense at all. All in all, a very satisfying cupcake--something that seems easy to do, but can totally fail in execution. Magnolia Bakery, for example, is a sugar bomb. The cake portion is fluffy and light--what one looks for in a nice and moist cake base. However, once you take a bite of that frosting, it's like you're licking sugar, in the raw, right out of the bag. The only time I had a cupcake from Magnolia's was my last--I could only have one bite, no more. It's just a relief to know that there are other cupcakes that exist out there that won't immediately send you into a sugar-frenzied coma. 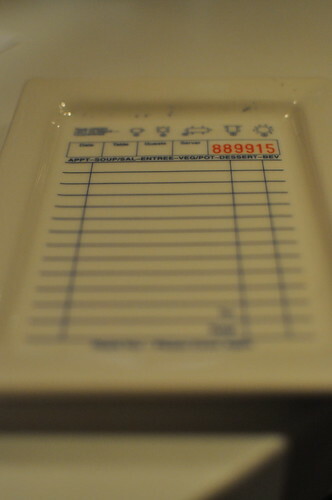 The (literal) guest check tray on which the bill was given. I subsequently found that this is sold at Fishs Eddy the following week for $7.95. Really, really cute! Findings: Great place for dates! Spot's cupcakes have really interesting combinations (e.g., vanilla yuzu lemon, chocolate green tea fruit jam, vanilla caramel Vietnamese coffee) with Asian-influenced flavors. And from what I've tasted, these cupcake combinations are executed very well--however unlikely they seem, they make really, really delicious combinations! 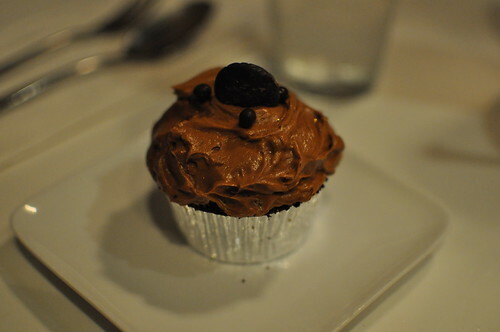 I would like to go back to try the other cupcakes to see if pastry chef, Pichet Ong, can uphold her awesome reputation! The sorbet was definitely interesting--I mean, how often do you have the chance to order spicy sorbets from a dessert menu?! I probably wouldn't order it again, but it's definitely something noteworthy to have had! 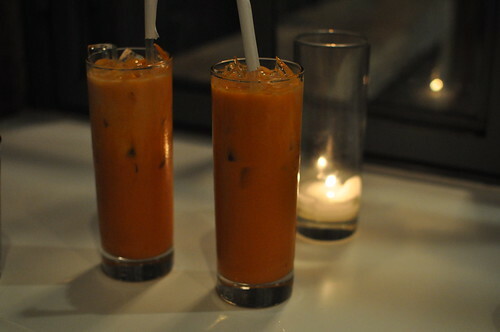 Price point: $3.75 for each Thai iced tea; $2.75 for 1 cupcake; $3 for one scoop of sorbet.